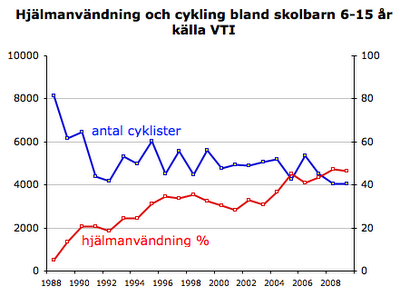 Here we have a graph from Sweden showing helmet usage and number of cyclists in the 6-15 age group. Erik from Ecoprofile.se blogged about it, in Swedish on his own blog. While helmet usage is up, the number of kids cycling is going down. They passed each other like ships in the night in 2007. Shocking, really, and a lesson to be learned. The graph is from VTI, Swedish National Road and Transport Research Institute. I can certainly understand why Swedish MP Camilla Lindberg has proposed a motion in the Swedish parliament to repeal the helmet law in her country. Hey! How about a contest?! 1. Which year did helmet promotion begin in Sweden? 2. Which year did the country pass a helmet law for under 15's? It's bit tricky with the second question, but hey, it's a quiz. No cheating with Google, just look at the graph. 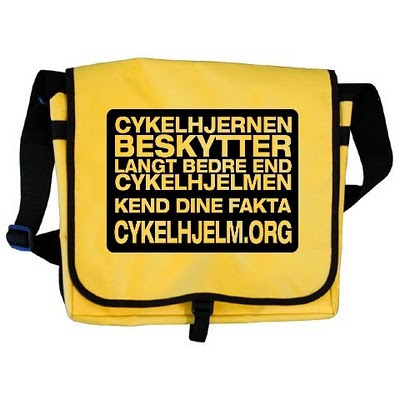 And please feel free to join the Cykelhjelm.org (bike helmet in Danish) Facebook group to support a return to rationality and common sense in Denmark. Her kan man se konsekvenserne af cykelhjelm promovering og påbud. De samme negative resultater ses over hele verden i samtlige regioner som har promoverede cyklehjelme, for slet ikke at nævne tvunget borgerne i cykelhjelme. Folk holder op med at cykle. Rationalitet er den nye frygtkultur. Kend dine fakta.